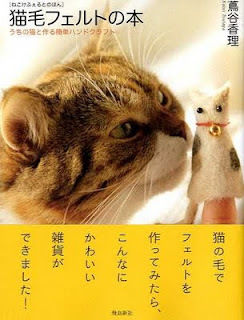 Felt Meets Cloth: Cat Hair Felt????! Sorry its been so long since I last posted. My book arts side of me has run away with itself and all my time! I do stitch occasionally still of course but I haven't felted since Christmas! Eek! I am dying to get back into some cloth work when I have a moment but there is a big book art project i'm working on which I want to get finished first. Anyway, I saw this Japanese craft book and laughed so much I had to share with you; can you believe you can use cat hair????! Amazing! Anyone tried it out before? yes i did. When my friend was very sad because her cat had died we felted up a bundle of his hair to always remember him. Amazing Martine; very touching memorial. Does it behave like wool, or is it different?